Donate to the Countryside Annual Fund Now! and leave in the PTO mailbox in the office. The Annual Fund is the Countryside PTO’s biggest fundraiser. It runs from the start of the school year until October 31st and accounts for approximately 40% of our annual budget. It is voluntary and tax-deductible. Contributions to the Annual Fund help to reduce the amount of fundraising necessary later in the year. The greater your generosity each September, the sooner we can turn to the more important work of making our children’s school the best it can be! The PTO budget for the school year is the equivalent of approximately $150 per student. Please contribute an amount that is comfortable for you! 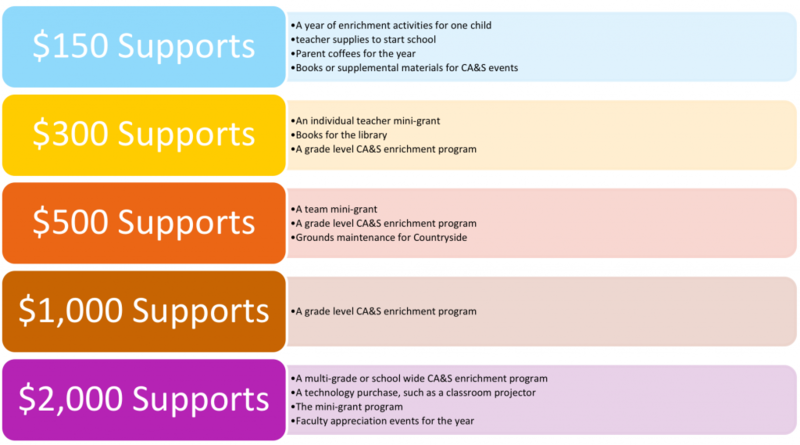 Below helps provide an idea of what amounts are needed to support different programs.